The City of London has been the financial and trade centre of the Greater London, and of England, since the start of civilisation in Europe. Geographically, it covers only an area of one square mile and the boundaries has remained almost the same since the Middle Ages. It is often referred to as just the City or the Square Mile. Settled before Roman times - and by every ruling and occupying dynasty since - there's enough to see in just the Square Mile itself to keep you going for days. 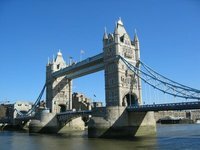 It's not just history - the City of London includes some modern attractions, including spectacular modern architecture and some of the world's top restaurants and bars. St Paul's Cathedral - The famous Anglican cathedral, and seat of the Bishop of London. Guildhall - The home to the City of London Corporation since the Middle Ages. Museum of London - Tells the story of London from prehistory to present day. Guildhall Art Gallery - Located within the Guildhall Yard. Mansion House - Home of the Lord Mayor of the City of London. Keats House - Museum of the poet John Keats. Clock Museum - Located within the Guildhall Library building. Monument - Commemorating the Great Fire of London in 1666. Old Bailey - Officially known as the Central Criminal Court, it is the most famous criminal court in the world. Prince Henry's Room - One of the few houses survived today from before the Great Fire. Temple Bar - An arch gateway which functioned as one of the entrance gates to the City back in those days. Barbican Estate - A modern high-density residential development with dramatic architecture. Tower Bridge - The most iconic bridge in London, often mistaken as the London Bridge. Tower of London - Located adjacent to the Tower Bridge, just outside the City's boundary, it is home of the Crown Jewels of the United Kingdom. Tower 42 - At a height of 183 metres, it is the tallest skyscraper in the City of London, and fifth tallest in London. 30 St Mary Axe - Known locally as "The Gherkin", the second tallest tower in the City of London. The City of London Festival occurs each year in June-July and has done since its inception in 1962. It offers a wide range of activities at indoor and outdoor venues across the square mile, all kinds of music, literature, visual arts exhibitions, guided architecture walks and much, much more. Many free events can be found on the program, so it needn't break the bank! Kings Cross to the north of the City, for destinations northeast of London. Destinations served from Kings Cross include Edinburgh, Inverness, Newcastle, Durham, Leeds and Peterborough. St Pancras is the new home of the Eurostar, with regular direct services to France and Belgium. Some services for destinations in the Midlands and in South Yorkshire (indlucing Sheffield) also depart from here. Euston for destinations to the nNorthwest of London, including Glasgow, Manchester, Liverpool and the Lake District. Cannon Street, London Bridge and Charing Cross stations serve destinations to the south and southeast of London, particularly Kent. Victoria station serves trains for Sussex, Surrey and Hampshire, including Brighton and Portsmouth. The Gatwick Express departs from here. Waterloo and Paddington serve the west of the country - destinations including Reading, Exeter, Bristol and Cardiff. The Heathrow Express departs from Paddington. Liverpool Street station serves destinations in East Anglia, including Norwich, Ipswich and Colchester. The Stansted Express departs from here. Blackfriars and City stations are on the Thameslink network, for destinations between Luton (including a station at Luton Airport) and Brighton. There are a large number of tube stations situated within the City of London - see 'Getting Around' for details. Apart from the heavy traffic and lack of suitable parking, the entire area is within the Congestion Charge zone - you'll be charged at least £8.00 simply for driving through it. Finding a public transport alternative is generally a better idea. Buses are cheap (90p per journey with an Oyster card) and frequent, serving destinations all across London. The easiest way to figure out the bus routes is to use the TFL website. It is possible to travel to the public piers in the City of London by Thames ferry, and this is an interesting way to get a different view of the city. It is possible to travel all the way from Hampton Court in the west of London, or from Woolwich in the east, and from any pier in between. Full details on the TFL website. As mentioned above, because of the heavy traffic and lack of suitable parking, the entire area is within the Congestion Charge zone - you'll be charged at least £8.00 simply for driving through it. Finding a public transport alternative is generally a better idea. Public transport is by far the best way to travel the City of London. No major attraction is more than a short walk from one of the many Tube stations. Buses and boats are also available. See the TFL website for details. Exploring the City on foot can be interesting, and though the City of London itself is not that huge, the layout can be rather disorientating. Make sure you take a good map - every Londoner has a copy of the A-Z Guide, and it would also be a good investment for any tourist. I spent 3 years in London. This is version 21. Last edited at 14:06 on Mar 6, 19 by Utrecht. 5 articles link to this page.